It’s entirely reasonable for OBceans to believe that the Ocean Beach Community Plan was a done deal – what with all of last years fanfare and mobilizing and petition drives and all. On July 29th, 2014 – nearly one year ago exactly, the San Diego City Council approved the Community Plan in an unanimous and historic vote. Yet, there’s always been one more hurdle to go – and it’s always been the California Coastal Commission. The Commission always had to give its stamp of approval on the Plan. Their vote on it was originally set for August 2014 – but has been constantly pushed back. Plus, city staff has had a year in which to iron out any issues and problems with the staff of the Coastal Commission. But whoever or whatever dallied – here we are at the last moment – the Coastal Commission is now set to have the OB Plan on its table in mid-August – one month away – for the City to present the changes it has made to the community. And the community – in the form of the OB Planning Board – is set for a presentation by city planners of any and all changes that have been written into the Plan since the City Council vote last yet, and then the Board has to do their own review. Plus the Plan then goes back to the City Council for one final review, before the Commission gets it formally. 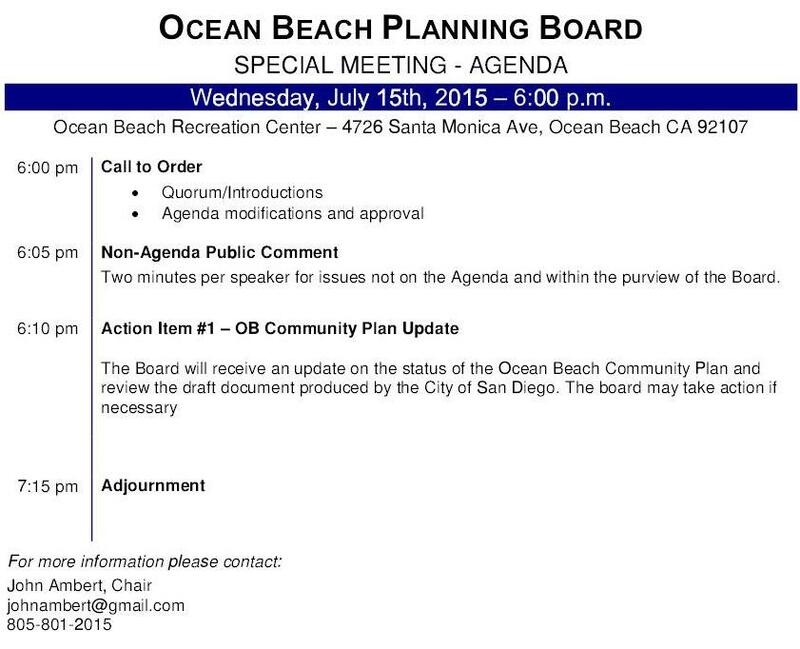 So, tonight’s the night – if you have followed and or favored the OB Community Plan and the entire update process, and were in spirit with the hundreds of OBceans who attended last year’s City Council hearing – then tonight’s your night. Attend this Special Meeting. I’ll try to make it. I’m hoping the city staffers will have that list of changes. Wait a minute. If OBcians on the planning committee have not been able to see the changes yet, how can they be expected to decide tonight if “all’s good”?